Culms 25-70 cm, erect to slightly geniculate at the base, forming few to many tillers. Sheaths with hyaline margins, ciliate; blades 7-15 cm long, 3-6 mm wide. Spikes 5-12 cm long, 0.3-0.6 cm wide, distinctly moniliform, with 3-11 fertile spikelets; rudimentary spikelets usually absent, sometimes 1-2; disarticulation in the rachises, the spikelets falling attached to the internodes above. Fertile spikelets 7-11 mm, urceolate, with 2-5 florets, the distal 1-2 florets sterile. 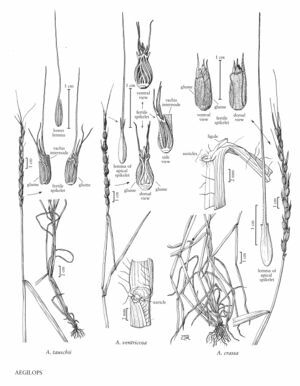 Glumes of fertile spikelets mostly glabrous, veins setulose, apices truncate, with a sharply acute tooth to 3 mm; glumes of apical spikelets 7-8 mm, with a central tooth or awn flanked by 2 short teeth, central awns to 0.9 cm on the lower glumes, to 2 cm on the upper glumes; lemmas of fertile spikelets 8-10 mm, adaxial surfaces velutinous, apices awned, awns 0.3-3 cm, solitary; lemmas of apical spikelets awned, awns to 4 cm. Caryopses 5-7 mm, adhering to the lemmas and paleas. Haplomes DN. 2n = 28. In the Flora region, Aegilops ventricosa was collected once in New Castle County, Delaware. It is native to the Mediterranean area. The Arabic name, Oum el guemab, translates as 'mother of [durum] wheat'. It occasionally forms hybrids with Triticum durum, although the two species have no haplomes in common.